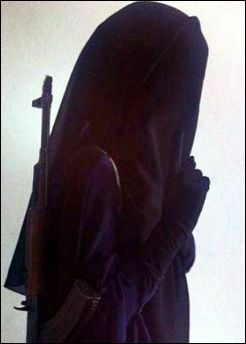 An 18-year-old British ISIS member, known by her twitter handle @UmmKhattab_, posted this image of herself last year. In Khaled Hosseini's soul-piercing novel A Thousand Splendid Suns, the character Nana, a poor, unwed mother, tells her five-year-old daughter, Mariam: "Learn this now and learn it well, my daughter: Like a compass needle that points north, a man's accusing finger always finds a woman. Always. You remember that, Mariam." Hosseini's best-selling novel was about life in Afghanistan, but in the 30 words above he sums up the way men govern the lives of women across much of the Muslim world. Like Mariam, millions of Muslim girls are told very early in life by their mothers that their place in society is one of submission; submission not to God, but to man. Hosseini's 2007 book remained at number one on the New York Times bestseller list for four months. In its first week on the market, it sold over one million copies. But if there is someone who seems not to have read the novel, it's Canadian Liberal Party leader Justin Trudeau. Trudeau's recent championing of the niqab [a veil completely covering the face, but not the eyes] as a basic human right has aided Islamism in Canada and undermined millions of liberal Muslims around the world. This includes the women in my own family, not to mention my late mother, who threw away the niqab in 1946. The niqab is not just a medieval symbol of female servitude. The controversy began with the case of Zunera Ishaq, a Pakistani immigrant who wanted to take her Canadian citizenship oath with her face covered. On being told she could not do so, she went to court and won the right not to remove her veil, while taking the oath. Ottawa has appealed this lower court decision, with Prime Minister Stephen Harper mounting a vigorous attack on the niqab. He told the House of Commons: "This is a society that is transparent, open and where people are equal, and I think we find that (not uncovering one's face while taking the oath of citizenship) offensive." A few days later, he told the Commons, "Why would Canadians, contrary to our own values, embrace a practice at that time that is not transparent, that is not open and, frankly, is rooted in a culture that is anti-women?" Harper emphasized that many moderate Muslims agreed with the government's position of banning the niqab from citizenship courts. For his part, Trudeau tried to portray Harper as racist, equating Muslim women not being permitted to wear face masks in citizenship court to the plight of Jews who fled Nazi Germany, but were not allowed to enter Canada. Trudeau could not have been more wrong. While the Jews on board the St. Louis were not permitted to land in Canada, and went back to near certain death, the Muslim immigrant, Zunera Ishaq, was welcomed to Canada after leaving the Islamic State of Pakistan. Leaving her specific case aside, what is it about this piece of cloth that triggers so much self-righteous angst among so many followers of Islam? How could the covering of a woman's head or face — which is not a requirement of the Qur'an — end up as the most defining symbol of Islam? And what is the rationale behind the obsession with the niqab among the world's Islamists? The fact is, the niqab and, I would argue, the hijab, are today not just medieval symbols of female servitude; they also serve as flags of Islamism, dictated by the Muslim Brotherhood in the Arab world and its equivalent in South Asia, the Jamat-e-Islami.